It’s not easy nowadays to win over your audience in an abundance of online content, and the short attention span of human beings isn’t making things any easier. It’s always a challenge to make your content stand out, but this doesn’t mean that you should be discouraged from creating it. As the average human attention span has dropped to just 8 seconds, however, how can you make content that captures your audience’s attention before it’s gone? This is the first thing that will help you beat the readers’ attention span. It is very important to understand your audience, as this will help you create more relevant content for them. Monitor your competitors’ content and find the gaps that you can fill in. Having well-structured content helps readers to stay longer on your page. It’s not just the quality of the content that maintains readers’ interest, but also the way you present it. Add takeaway tips at the end of your content to help readers digest the most important parts. As with a good content structure, images make reading a page more appealing. From the header or feature image that offers an introduction to the topic (which may also be the image used on your social shares), to the additional images included throughout the text, images help to separate one section from another in the most engaging way. They also help the eyes relax from a long sequence of text (which might otherwise be a little dull to read), while making it easier for the brain to process what it just read. Moreover, images can offer additional value with the use of quotes, stats, or even tips that facilitate quick reading. These images can double as shareable content on your readers’ social feed, giving you more mileage from your content. You might assume that a short attention span will require an equally short piece of content for consumption. 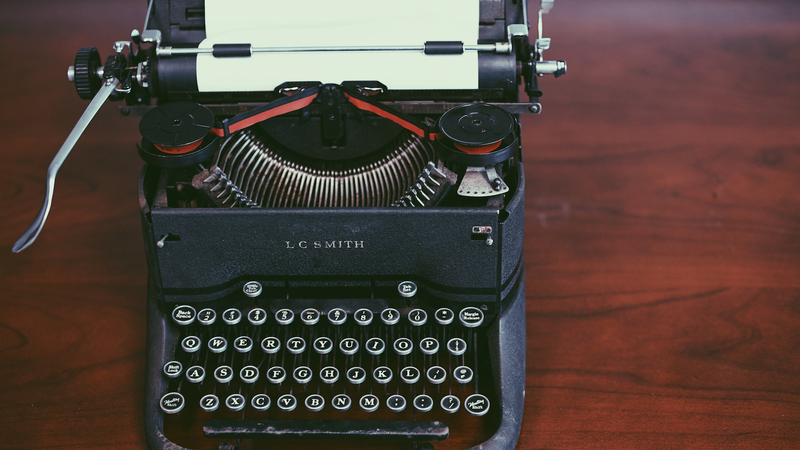 This is not always the case, as well-executed long-form content is still a valuable asset to your blog. Provided that you’re adding value to a topic they find interesting, length should not discourage your readers from consuming your content. Remember that long-form content doesn’t have to be boring: structure and images can contribute to make the reading experience easier. In fact, according to Orbit Media Studios, blog content is getting longer year by year. 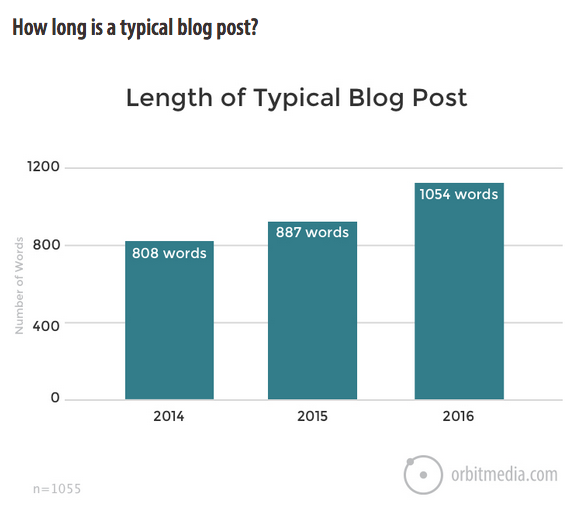 In 2016 the average blog post length was 1054 words – up from 887 words in 2015. This is a good reminder for all of us that there’s no need to be afraid of longer content. 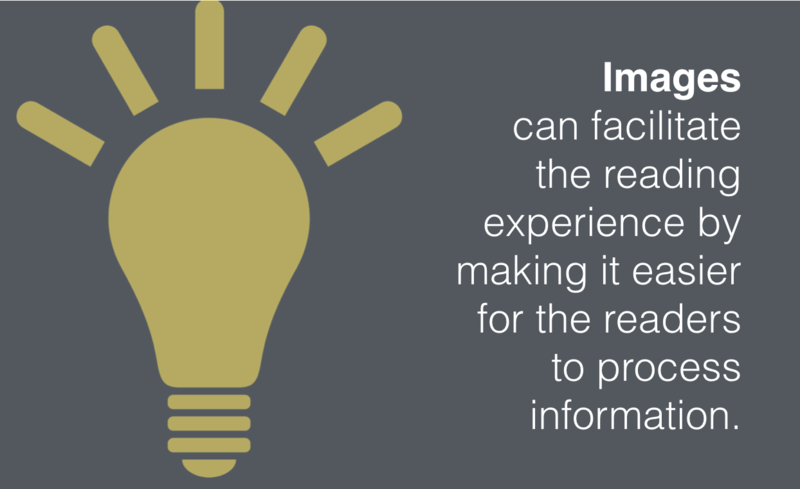 All you need is to focus on relevance and a good user experience to keep people engaged on the site. Every type of content serves its own goal, and all of them can enhance your message. For example, if you want to turn a complicated concept into a simpler analysis, then a visually​ appealing infographic​ can be useful. If you want to find new ways to repurpose your content, then you can turn a blog post into a presentation, a video, or a podcast. These allow you to promote your content across new platforms and reach the right audience with the right type of content. And many of these content formats are more engaging to time-starved audiences than a text-based post. After all, content marketing is all about being creative with your content and its distribution. If you’re wondering how social proof can convince your audience to spend more time on your site, here’s an example of how it can work in practice. We all have more chances to read the content that our friends, or our favourite influencers, share on their social feeds. This is due to the trust that we’ve built up with them, and the belief that their approval serves as the credential we need to visit a page. This can become even more important if it’s about a page that we haven’t visited in the past. It’s not a bad idea to build relationships with other people to ensure that our site’s content reaches more people. This way the connection becomes more genuine and there are more chances for new readers to actually pay attention to our content. If you want to maintain your readers’ attention while reading your content, you have to test your page for any distractions. It’s easy for the reader’s eye to be distracted by a pop-up, a shiny sidebar, or even untidy formatting. That eye-catching banner ad might be doing its job extremely well – and it may also be competing with your content for attention. Content success is all about focusing on the reader and the browsing experience. That’s why it’s always useful to switch sides and visit your pages from time to time as a reader. Are you willing to spend enough time to read the content? Is there something you need to change? It’s useful to keep in mind that the shorter the attention span, the bigger the challenge to appeal to your audience. Don’t underestimate the importance of quality content – whether long or short-form. When done well, content marketing can contribute to boosting a site’s position in search rankings. And although this may not seem like the most obvious benefit to a successful content marketing strategy, it’s an effect that no business can ignore. On February 28, 2017, ClickZ Intelligence presented the webinar ‘Still using .com? Here’s why 50% of all Fortune 500 companies are about to use .brand’ in association with Neustar. It’s not easy to create a successful inbound marketing strategy, but it still offers great opportunities once marketers understand its potential. A new study by HigherVisibility.com, whose findings were shared exclusively with Search Engine Watch, has set out to investigate the relationship between the top ranked websites in various industries and the inclusion of keywords in their URLs.